Logitech has unveiled its Notebook Kit MK605 – a trio of peripherals for your laptop including a wireless mouse, keyboard and stand. 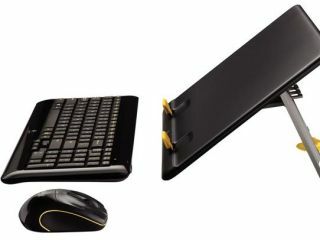 The Notebook Kit MK605 comprises a laser mouse and wireless keyboard that are both connected up to the laptop via the nifty Logitech Unifying receiver. With a UK release date of November and a price of £79.99, Logitech is no doubt trying to lure in the gift givers ahead of Christmas. The pivoting riser stand can be set in three positions so you can pick out your favourite height, and can be used for laptops up to 15.6 inches. "Depending on the task at hand, you can pick and choose which components to use," said Rory Dooley Logitech's Senior Vice President of Control Devices. "For more involved tasks you can use all three. Or, when chatting with friends you might just need the keyboard, while when surfing the Web from your favourite coffee shop you'd be more comfortable using your mouse." It would have been nice if the riser had a fan or a speaker built in, but it's certainly an option if you are seeking a whole range of laptop add-ons.